Hi ladies I have for you my first Christmas manicure of the year! Well not exactly the first as I've done a few plain Xmas skittles but I didn't bother taking photos of them because they were't super exciting. 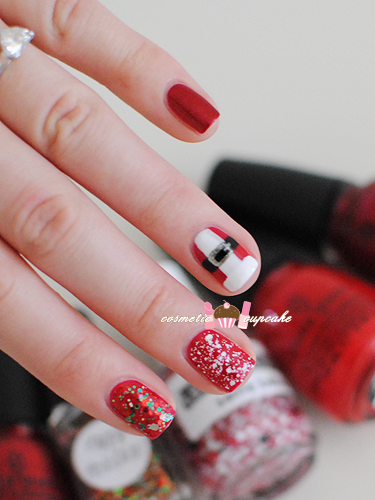 I haven't done a santa suit mani before so thought I'd give it a go! Not the neatest job because I haven't done any nail art in ages so I'm rusty but oh well! I threw in some trusty glitter so you get distracted LOL. Index finger: I used 2 coats of China Glaze Poinsettia and 2 coats of Lynnderella Happy Holo Daze! which is a perfect Xmas glitter. Oh I wish Santa would bring me more Lynnderella's for Christmas!! Middle finger: I used 2 coats of China Glaze Poinsettia and 2 coats of Lush Lacquer Santa Baby. Unfortunately I couldn't get any of the black hex glitters out of the bottle doh. Ring finger: I used 2 coats of China Glaze Poinsettia as my red base. 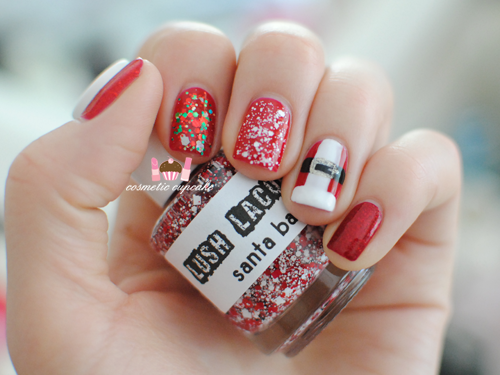 For the white trim on Santa's suit I used Orly White Tips and for the black buckle I used Kiss nail art striper in black. I used China Glaze Midnight Kiss for the belt buckle. Aww, this is so cute <3 LOVE IT! wow! I love your manicure! How cute is that combo :) Liking the green confetti on the red base!! So Adorable, I love his belt! Wedding makeup and another giveaway! Blog sale and China Glaze OMG auction is live!